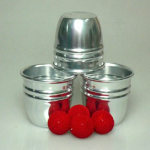 You are getting the Aluminum Cups and Balls set, plus the Amazing Easy To Learn Tricks with Cups and Balls DVD! 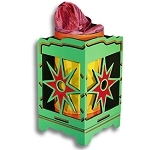 With this package, you're saving money! 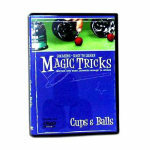 And with this Amazing Easy Tricks DVD you'll learn this effect quickly and easily. You'll also learn some basic extra moves, like the Wand Spin. 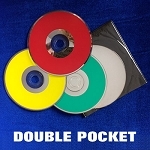 It's a TERRIFIC beginner package! Easy to learn, but also amazing to see! 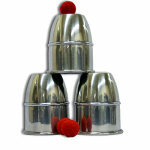 The Cups are smooth aluminum construction, with the rolled rib in the middle. Nicely balanced, and polished to a beautiful mirror shine. 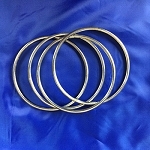 They are 3.25" high, 2.5" diameter, and are not gimmicked. 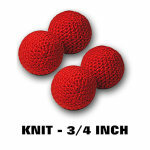 The balls are 3/4" ungimmicked knit balls. 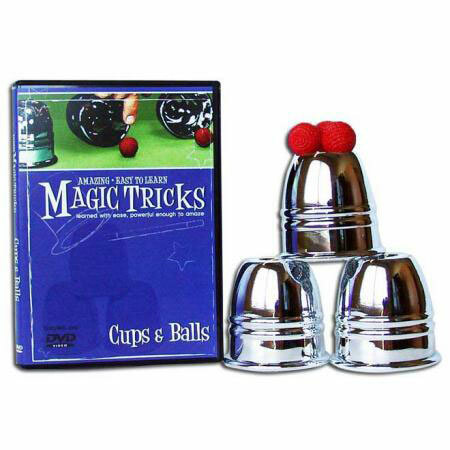 And this set comes packaged with a fantastic instruction DVD set- everything you need to get started with Cups and Balls magic! It is strongly recommended that you use a CLOSEUP MAT. 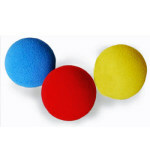 Closeup mats or pads are padded surfaces that make it possible to move the Cups and Balls smoothly without snags, slips or runaway balls. 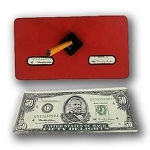 MagicTricks.com carries many different sizes, shapes and colors of Closeup Pads. 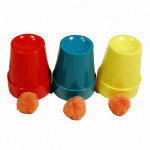 We also carry extra knit balls sets. Just in case you lose one, or you want to replace worn ones. And some great routines depend on using a wand (for the Vernon Spin move, for example). 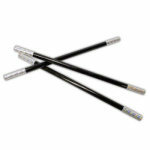 Our Magicians' Wands are nicely balanced and easy to use in your routines. 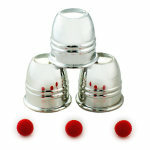 Cups are 3.25" high, 2.5" in diameter. 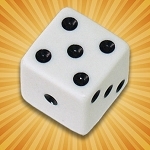 Replacement balls are available at MagicTricks.com. 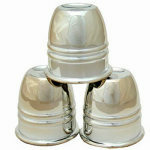 It's amazing how the cups look professional quality, yet are sold for a very affordable price. 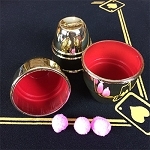 I would recommend this set, because although the chromed plastic cups look nice, they don't feel or sound like metal, and the chrome cups are $120 which is definitely not the most affordable trick on the market. this set looks professional, feels professional, and sounds professional (when they clink together), and from a distance, you can't tell the difference between them and the chrome ones. Very nice trick. I'm very impressed. 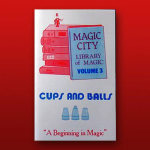 doing the cups & balls is recreating magic history. The oldest trick in the book. This set is great quality for a reasonable price. The cups have good weight. Get a close up pad for best performance. Very happy with my purchase! !